If I were asked what I love most about this tree, I probably couldn't give just one attribute, but the first thing that comes to mind is how much I enjoy the pleasant fragrance the tree emits, and how its handsome stature makes a perfect Christmas tree. But then maybe it's because it's so beneficial to songbirds and other wildlife, protecting and feeding so many over winter. Or maybe it's how much history the tree has, or how it provides medicine for many. Often native plants are full of rich history, wonderful legends, superstitions and folklore. Along with a touch of romance or magical properties, many hold medicinal virtues and have real healing powers that were used by our ancestors. I have discovered that the eastern red cedar has all of these qualities. As I was sitting at my computer this morning, thinking of all the things I love about the eastern red cedar, my husband asked me what I was planning to write about. Knowing how he feels about this particular topic, I was a little defensive when I responded I'm writing about a very special and sacred tree. Having heard these words before, he immediately knew I was talking about the Eastern red cedar, Juniperus virginiana. If you knew my husband, you would know that he never forgets anything! So he promptly quoted me saying "Juniperus virginiana is a very sacred tree known by many Native American tribes in North America. Certain tribes consider it bad luck to cut one down because they hold the spirit of their ancestors." That's right my dear, your memory is amazing. Yes, he called the tree by its botanical name to impress me and make me smile; it works every time. We first had this conversation about three years ago when we found a little red cedar tree that had sprouted along the path from our house to the road; probably from a seed dropped off by a bird. He immediately wanted to cut it down, calling it a "weed tree" and I, on the other hand, was happy to see an evergreen growing amongst all the deciduous trees; it's a cute little Christmas tree I told him. Growing up, we had a fresh cut tree every year for Christmas, and to this day I love the smell. As practical as my husband is, I think the story of the tree being sacred is what saved it, because it's still here. Somewhere I heard that this tree is known as "the graveyard tree" because once it grows big enough to shade you, it's time for you to die. If that's true, I'm sure glad that it's a slow growing tree. 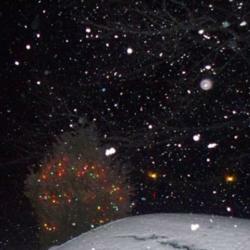 My husband wasn't finished telling me what he knew about the tree either. 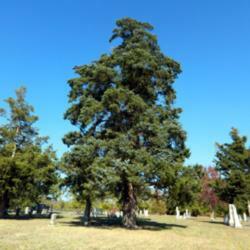 He has family in Louisiana who passed along some interesting history about the Eastern red cedar. I didn't realize this but, Baton Rouge in Louisiana began with the Native Indians and was named after the Eastern red cedar. In 1699 a French Canadian explorer by the name of Pierre Le Moyne, Sieur Iberville led an expedition up the Mississippi River. His party consisted of 200 men that were the first Europeans to travel upriver. When the expedition reached a spectacular red pole adorned with animal skulls, they named the site "Baton Rouge", which is French for "Red Stick". (This was the heartwood of the Eastern red cedar which is a very vibrant red color). The current Baton Rouge area was actually a boundary between two Indian tribes: the Bayougoulas and the Oumas (now called the Houma Indians). The Indians marked their boundary with red cedar poles decorated with blood, fish heads, and animal skulls. The Native Indians obviously held the Eastern red cedar trees in high reverence which was also recognized by the explorers. Known as the “Tree of Life” by Native Americans, the Eastern red cedar was and still is used in ceremonies. Regarded as a holy tree, it has often been burned in purification rituals and sweat lodges. When burned, cedar acts as a purifier, cleansing the area in which it is burned and emitting a pleasant scent. 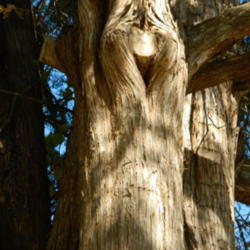 The wood from the tree is considered especially sacred, holding power, it is very much alive spiritually. It’s interesting to learn that a number of tribes include cedar as one of the four sacred medicines, which are cedar, sage, tobacco and sweet grass. Leaves and twigs were boiled and steamed to help with bronchitis and other respiratory conditions. Berries were made into a tea for canker in the mouth and to stop vomiting. A warm politice of the boiled berries was used for rheumatism and arthritis. A tea from the roots was drunk as a general tonic. Elders say to put some red cedar in your shoes and only goodness will come your way. Actually, the entire tree was used in some way as medicine by Native Americans. It was also burned as incense during prayer, and as a purifier for cleansing. Many Cherokee decendants carry a small piece of cedar wood in their medicine bags worn around the neck for protection. 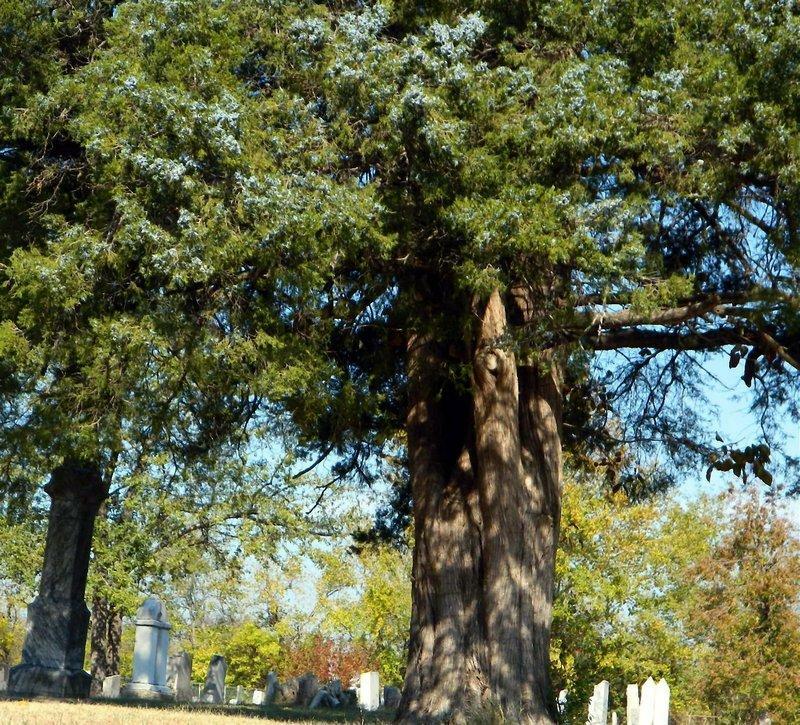 In a legend of the cedar tree told by the Cherokee Indians, the trees literally hold spirits of their ancestors, and they believe the wood carries powerful protective spirits. It is told that the Creator placed the spirits of their people in a newly created tree which makes it a very special tree indeed. I learned of the Cherokee Indians when I was very young and remember the story of the tree spirits. I guess I've always believed it to be true. The wood was used to make items such as canoes, bows, bedding, mats, drums, and flutes. In another old Indian legend, a young hunter has a vision of a redheaded woodpecker that teaches him how to make the flute from a red cedarwood tree; the young hunter uses his flute as a love charm to win his wife, who was the daughter of a big and powerful chief of the village. It made its way into folklore; bringing good luck and good fortune, health and healing, cedar was burned to invite positive energy, happiness, harmony and peace. Cedar chips or shavings were burned to purify the vibrations of your sacred area and house, driving out all negative entities. Fresh cedar boughs are used as brooms for purification, exorcisms and to cleanse temples. An essential oil can be obtained from the wood and cedar camphor is used in soaps, face creams, deodorants, perfumes, polishes, etc. Cedarwood oil was used by the ancient Egyptians for cosmetics, magical perfumes, as an insect repellent and, to embalm mummies. 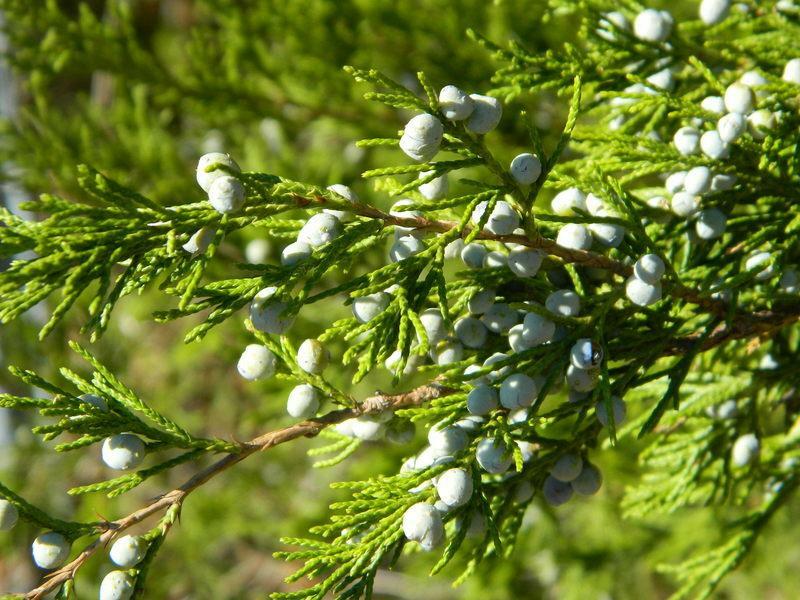 Eastern Red Cedar wood is still used today in herbal medicine for respiratory conditions, as an expectorant to help clear catarrh, coughs, bronchitis and sinusitis. As an anti-spasmodic, it’s used to treat aches, pains and stiffness, arthritis and rheumatism. It’s also known for its use in treating cystitis, as an antiseptic, astringent, and as a diuretic. Made as a tea, it can ease nerves and is claimed to relieve headaches. Used in skin care, it is known to be good for an oily complexion. The tree is also said to contain an anticancer agent called podophyllocotoxin. 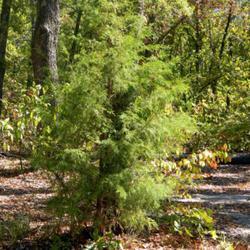 Eastern red cedar tree is important food and shelter for wildlife both large and small. The juicy bluish-black berries provide winter food for many kinds of wildlife and songbirds, including the Cedar waxwing, named for this tree. The twigs and foliage are eaten extensively by hoofed browsers. In addition to their value as food for wildlife, cedars provide important protective and nesting cover. The trees are widely used in shelterbelts and wildlife plantings. Pheasants, doves, robins, song sparrows, and mockingbirds use these trees for nesting. Warbles, myrtles, various sparrows and other birds use the dense foliage as roosting cover. In winter, their dense protective shelter is especially valuable, particularly in deciduous forest areas. 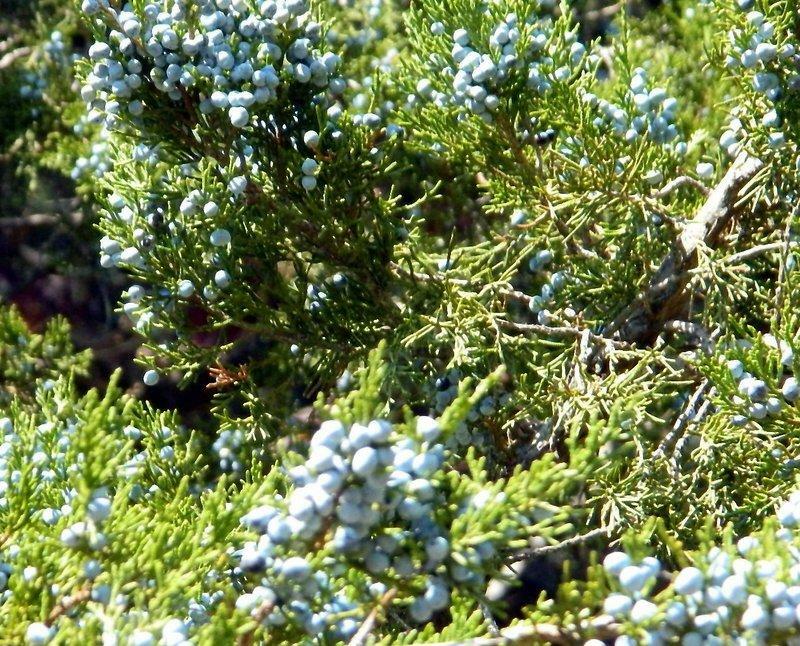 Juniperus virginiana is a host plant for the Juniper hairstreak butterfly, Callophrys gryneus. These mint green to copper-brownish butterflies are a widespread species found across much of the United States. 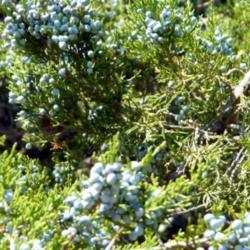 They seek out the juniper for larval food and laying their eggs, which can be found at the tips of the leaves. 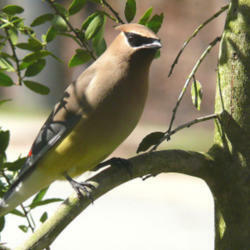 Males are highly territorial on cedar trees, where they perch in search of females. Eastern red cedar has been known to carry cedar-apple rust, a fungus (Gymnosporangium) that can cause dark leaf-rust spots on apple trees. Although these rust spots are unattractive, Juniperus spp. cedar apple rust is not know to be extremely harmful. If you have apple trees within a half mile of the Eastern red cedar, your apple tree can be infected. In some areas the trees are considered invasive, even if they are native to the region. Cedars can be bothered by the bagworm moth. You may find little silk sacks covered with the cedar's own scaly foliage on the outside; these are made by the larvae of the moth as camouflage from predators. Pick the sacks off the trees in winter and trash them and you will have no bagworms. The red cedar does well in all types of soil from poor or gravely to sandy and clay soils. It is resistant to extreme drought, heat and cold temperatures. 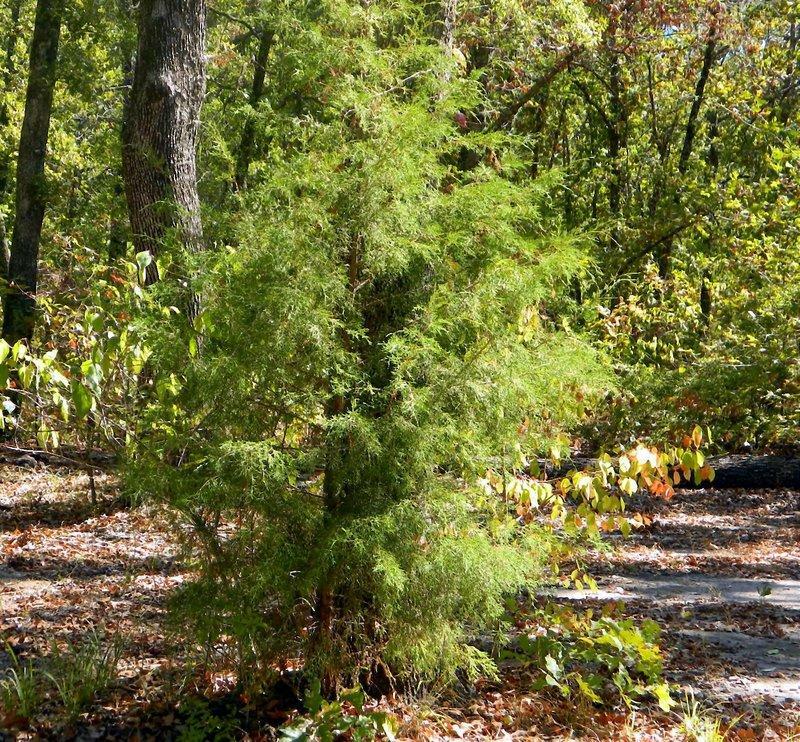 Juniperus virginiana, Eastern red cedar, Eastern redcedar, Red cedar, Pencil cedar, Baton Rouge, Virginia juniper is a perennial evergreen tree. It's an aromatic tree with a conical, pyramidal shape when young, becoming broad and irregular with age. It's a slow growing tree that usually reaches 10-60 feet in height but can reach heights up to 90 feet tall. The foliage is flat and scale-like coming off twigs and branches, with evergreen color that can turn more copper or bronze in winter. The trees are dioecious, meaning there are separate male and female trees. The males are often small, yellow-brown in color and occur in large groups. Pollen is produced by the males, early in the spring. In the fall, the female tree produces an abundance of powdery bluish fruits. 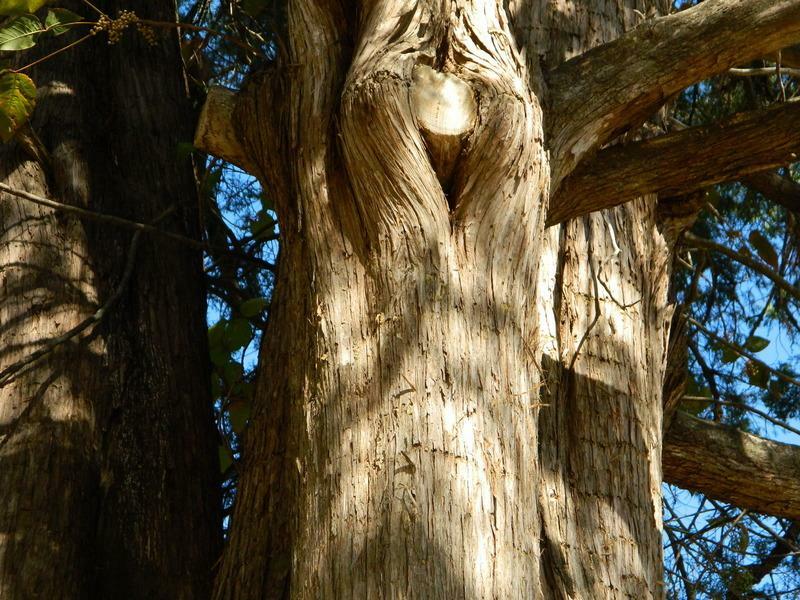 The bark of the Eastern red cedar is a reddish-brown color, dulling with age. It's the heartwood at the center of the trunk that has the deep red color. 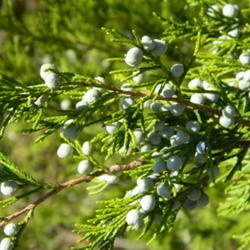 The Eastern red cedar is actually a sturdy and durable juniper tree. 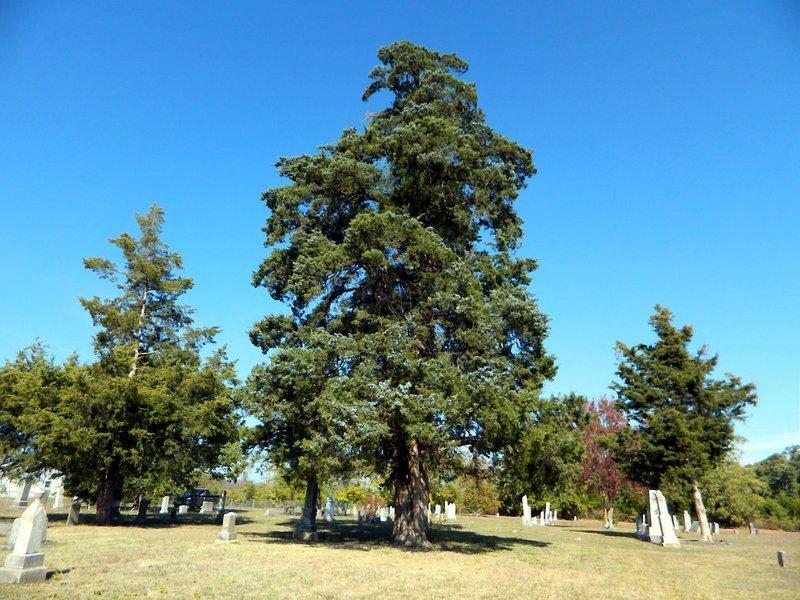 Of all the more than 50 species of junipers, J. virginiana is the only one that is not called a juniper. It can also grow to be a very old tree, some of them live for hundreds of years. 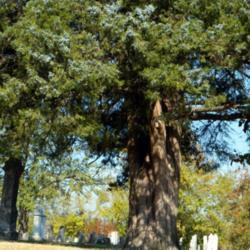 According to Wikipedia, the oldest red cedar reported, in Missouri, lived to be 795 years old. The Eastern red cedar is native in 37 states; from Texas to North Dakota and east from Florida to Maine, and parts of Oregon; native in Canada - Ontario and Quebec. The seeds have a hard seedcoat and can be hard to germinate. They do require a period of cold stratification, followed by a warm period. Best with fresh seeds sown outdoors in fall, or stratified and sown in spring. 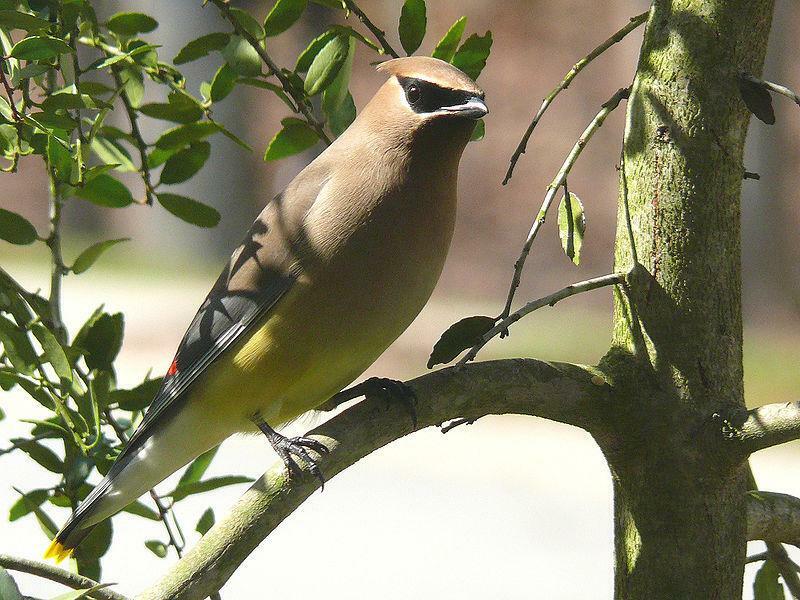 The cedar waxwing bird does a good job of distributing the seeds, after eating the berries with much better germination than seeds not eaten by the birds. Maybe that's how the little red cedar showed up along the path from our house to the road. 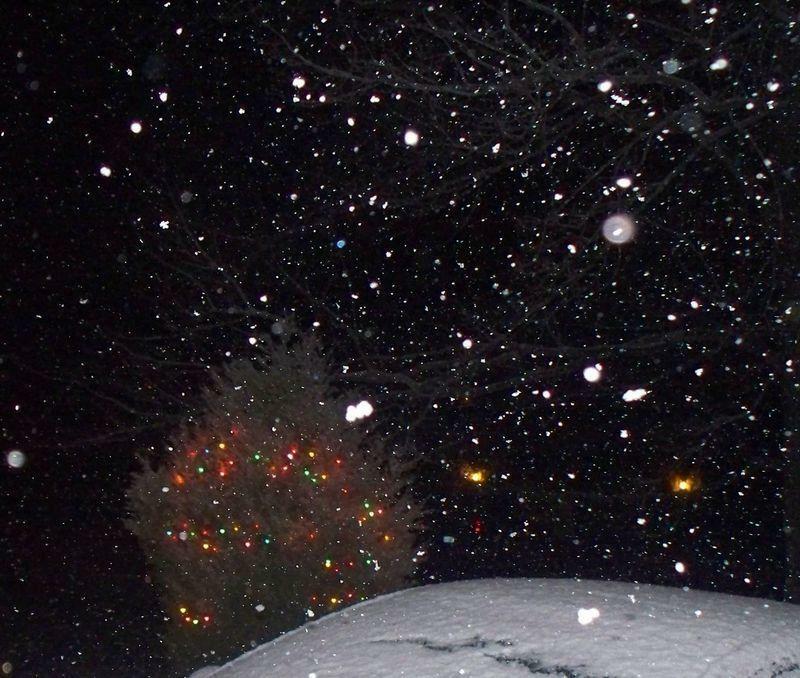 Photo credits: A special thank you to the editor, Sharon for sharing a picture of her beautiful eastern red cedar Christmas tree; a picture worth a thousand words!